Here are 16 songs that are sure to get your toes tapping -- all in the joyous revolutionary spirit of Emma Goldman. Starting with "Emma Goldman" - a wonderful tune by Paul Gailiunas and Helen Hill, and ending with Suzanne Buirgy's touching "Lullaby," this CD features some of Anne's most-requested material plus six new songs recorded in June 2006 at Wilkin Audio in Pittsburgh. Longtime Anne Feeney fans will appreciate the inclusion of "Dr. Jazz," and "The Sheik of Araby," her two show-stopping duets with D.C. Fitzgerald. And old pal and fiddling wizard Bob Banerjee returns to the current sessions for work on "Lullaby" and "Let Their Heads Roll," complementing his early work on "Phil the Fluter's Jam," "Amelia Earhart's Last Ride," and "Dr. Jazz." Those early sessions of Bob's were his first studio work. Bob has gone on to work with Gaelic Storm, the Irish band featured in the film "Titanic." Once again, Anne has recorded a song by her friend and mentor, Jon Fromer. This time it's Fromer's collaboration with Bernard Gilbert, "My Feet Are Tired," a very danceable tribute to Rosa Parks and the thousands of people whose sacrifices led to the success of the Montgomery bus boycott in 1955. Janis Coppola's fantastic clarinet work brings excitement to Roy Zimmerman's hilarious "Defenders of Marriage," and pathos to Ted Warmbrand's evocative, "Who's the Criminal?" 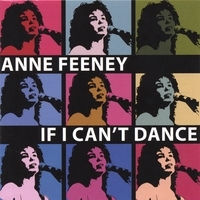 Like the cover art, which is an updated reworking of Anne's trademark logo (with Andy Warhol's inspiration), this CD features some of Anne's best early work, which can be seen in new ways as it blends with some of the best in contemporary folk music. Jack Erdie's "Let Their Heads Roll" is a consummate protest song in the spirit of Phil Ochs -- one of Anne's earliest inspirations. Anne's searing "Shell Game," written in 1991 and appearing first on "Look to the Left," is prophetic in hindsight. And her beautiful Spanish translation of "I Married a Hero" - "Me Casé con un Heroe" - serves as the perfect lead-in to "Who's the Criminal?" Sample all sixteen tracks, and add this wonderful recording to your collection today! 2007 recipient of the Mother Jones Award from the Pennsylvania Labor History Society. Utah Phillips calls her "the greatest labor singer in North America." Anne's award-winning songs are sung by activists everywhere, including Peter, Paul and Mary. What a delight! I really enjoyed hearing this album - fantastic lyrics! I love this CD for the versatility. Ballads, rap, jazz...and that incredible voice is mesmerizing in all genres, and in at least two languages! I have lots of her cds and they are all great. She is even better in person. with lots of message, and oh, so much music. Anne, you're a knockout on this CD, a great singer with a sharp sense of humor and justice, and a fine touch in selecting songs. This CD is hard-hitting politically and terrifically musical. Get it, play it for yourself and your friends! Great songs, great arrangements, great singing.